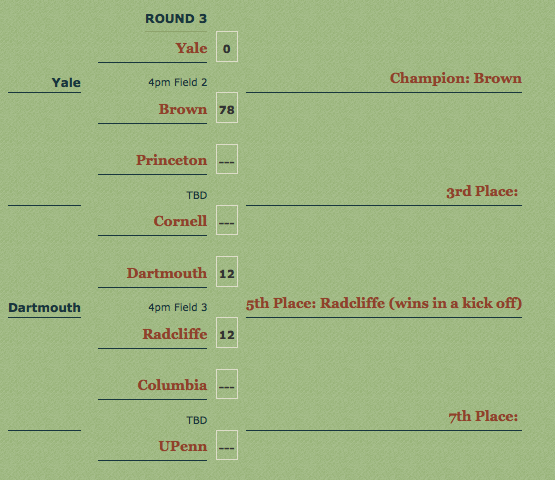 Each of the eight Ivy League universities will be in attendance for the 39th annual 2008 Ivy League Rugby Championships. 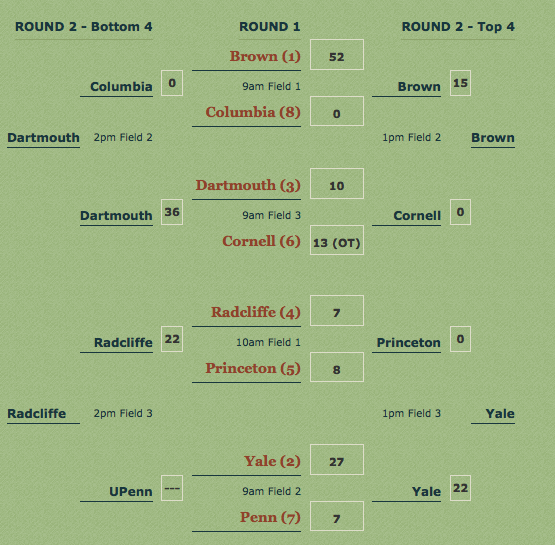 The tournament will be hosted by Brown University on April 12th, 2008. Warner-Berylson Fields at Brown University, part of the Olney-Margolis Athletic complex on Hope Street will play host to the 2008 Women's Ivy League Rugby Championship. Three turf fields will be utilized. The tournament fee is $300 per team. The fee covers fields, referees, EMT’s, security and event staff. Teams will not be allowed to play until the feel is paid. Mailed fees must be received by Wednesday, April 9, 2008. If the payment has not reached Brown by the date above checks may be made out to BWRFC by 9am at the registration tent. The tournament is an alcohol free event. We respectfully request that all teams and fans abide by this policy. All players must be CIPP registered and have undergraduate status at their University. All teams must submit a roster at the morning check-in. All Players must have adequate medical insurance. EMT’s will be on site. All matches will consist of 25-minute halves with a 5-minute halftime. Championship match will be 30-minute halves with 5-minute halftime. Red-card eliminates a player for tournament play. Kicker may advance the ball 10 yards on kicks for points, as the uprights are at the back of the Try zones. Will be clarified at coaches meeting. Teams must wear matching uniforms. Failure to appear within 5 minutes of kick-off will result in disqualification. Tom Dill from Brown will serve as the on-site tournament director. Prior to April 12 please feel free to direct questions of concerns to Kerrissa_Heffernan Brown [dot] edu. Each team must check in at the Tournament tent by one hour before their first match (8am Saturday) to confirm registration, roster and payment of tournament fee. Any additional information will be conveyed at that time. Concessions will be available at the fields. Restaurants and stores are located a few blocks from the field on Thayer Street. Rugby Imports will have a tent on site with equipment. The tournament directors will work with coaches and referees to select an All Ivy Tournament team. Seedings are based on the previous year's finish. The women's seedings are set for the 2008 one-day tournament scheduled for April 12 at Brown.